It's Wednesday once again =) This week over at Sweet Sketch Wednesday we have Jodie of Bugaboo Digi Samps Sponsoring us - Awesome!! 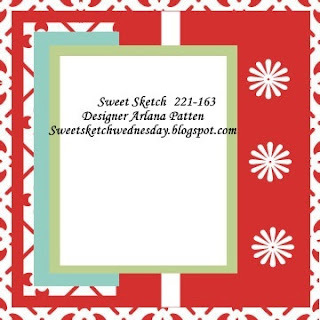 This week's Winner will receive 7 free digital stamps - WoW!! Now, if I were you, I would head right over and check out all the images and start planning the 7 you will win when your card is chosen the Winner because you know that your card is going to rock this Challenge... right? I do hope you will join in the fun this week, I can't wait to see your creations!! Such a cute gorgeous card Sally. I think I might have to get this image for myself. I love your daisies and your papers. Absolutely adorable Sally! Love your image and papers. They all work so well together. The daisies are the perfect addition too. This card is soo sweet. I love how your embellishments and Ava's dress both have daisies. Really darling!! I love Ava and Deacon. They are some of my favorite iamges at Bugaboo. Your card is super cute and love the added daisies. I hope you are having a wonderful week. This is so cute and I just love the pretty colors and the beautiful flowers! Hi Sally, sorry I think I'm loosing the plot, I thought I had already commented on everyone's cards last week. Love your super cute card, your colours are perfect together and this is such a cute image. Love your added embellishments just perfect. This is a darling card especially with such a cute Bugaboo image. Take care hope your week is going well for you?